A permanent home for DADAA in Lancelin means growing services in arts and health for the Wheatbelt region of Western Australia. DADAA Lancelin is located in the Wangaree Community Centre, a shared community space with opportunities for anyone in the community to get involved. Purposebuilt in 2014 to be a vibrant community space, Wangaree has three flexible studio spaces for workshops and two galleries for exhibitions. Arts activities include painting, sculpture, ceramics, mosaics, pottery, textiles, garden art and various visiting artist workshops. 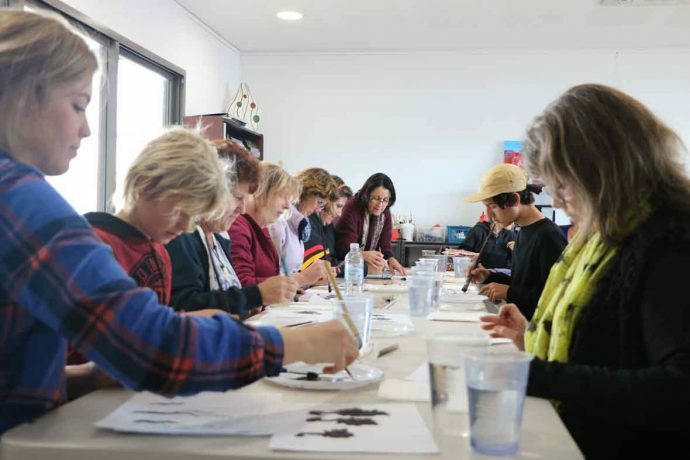 As Lancelin’s local arts centre, anyone from the community is welcome to enrol in arts activities. Our programs are open to and support young people with disability, aged and frail aged people, or those experiencing mental illness. We offer social support, transport and advocacy through the HaCC-based Community Connections Program. These are delivered by way of multiarts projects and outings.